Described as the X-Files meets Mission Impossible, a unique team of operatives, led by the mysterious Edgar Allan Raven, under the auspices of the organization called Raven, Inc., are brought together to investigate any and all cases of paranormal activity. Formed of both skeptics and believers alike, the team is often called in by local or government authorities when cases prove to be too bizarre, too unusual, or just plain unsolvable. Covering the entire spectrum of the unknown, from the supernatural to the dark side of man, Raven, Inc., searches for answers in areas that most people refuse to acknowledge even exists. 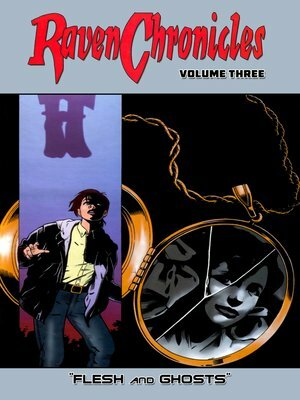 This volume collects comic issues #9-12 and features the cases of "Wolf Country", "The Ghost of Alonzo Mann", "Deadlands", and "The Compensators". "...Raven Chronicles is one of my favorite comics I like to read. It is like the X-Files, but more cutting edgy." - BuckSatan, CompuServe Forum.